This year, Black Friday is also the best time to change the wireless carrier, because Tello Mobile launched an unbeatable double offer. Usually, Black Friday is one of the best times to buy a phone. The time of year when carriers and retailers fall all over themselves to outdo each other's phone deals. 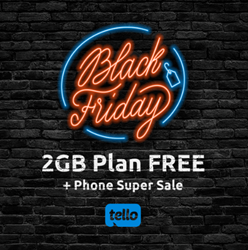 This year, Black Friday is also the best time to change the wireless carrier, because Tello Mobile launched an unbeatable double offer: they are giving away for FREE the 2GB Plan with Unlimited Talk & Text and great sales on a wide range of phones. The offer is available between November 19-28 and covers the 1st month of service. After the 1st month, customers will pay for the full price of the 2 GB plan, that is $19. The plan goes hand in hand with one of the phones Tello is having on sale. For instance, customers can choose the 256GB Apple iPhone 8, which is only $699 this Black Friday promo or the Motorola Moto G6 Play, for only $149. Flexibility is the keyword when it comes to Tello’s approach on plans: instead of predefined plans, customer may choose any minutes-data combo, based on their needs. Texts are on the house, being included in any plan and another big plus, customers may upgrade or downgrade their plans free of charge, anytime they want. Besides flexibility and easy porting process, Tello is also the only wireless carrier rated as ‘Excellent’, as a result of more almost 4k unbiased reviews from its customers on Trustpilot, a famous review website getting roughly 500,000 genuine testimonials about thousands of businesses each month.